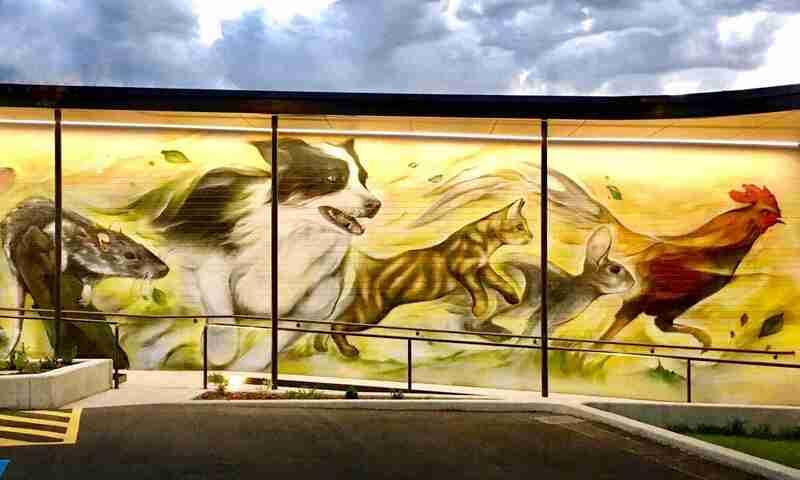 A quiet revolution has been underway in the Adelaide vet community. New evidence has shown us that the existing ways we treat cruciate ligament ruptures in dogs need updating. In response, since April 2016 we’ve been offering our patients Tibial Plateau Levelling Osteotomy (TPLO). We believe it’s the best procedure for medium to large sized dogs with cruciate problems. You can read about the evidence for the types of cruciate surgery here and why we choose TPLO. 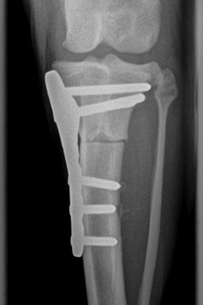 Although more expensive, locking screws and plates provide an increased implant stability. There is good evidence that the postoperative results are superior (Conkling et al, 2010). Results have been excellent. As of mid-2017 we have provided TPLO surgery to approximately 20 dogs in Adelaide. We’ve already written a general guide to preparing dogs to have surgery. We recommend choosing the pre-anaesthetic blood testing. In addition, you will need to be ready to nurse your dog through a long convalescence. Your dog will have a cut in the bone stabilised with a stainless steel plate and screws. He or she should be very comfortable but will need your care. TPLO is quite a stable surgery, and truly catastrophic failure is very rare. However, excessive activity will slow healing, cause extra pain and affect the results of the surgery. It is critical that you think about how you will prevent your dog from jumping or running for six weeks after surgery. 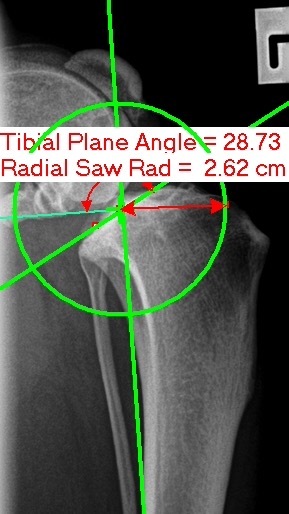 This is the average time it will take for the artificial fracture to heal. By being strict early, your dog will get back to full function faster. It is necessary to construct or purchase a holding pen for when you cannot supervise your dog. The pen can allow walking around, but must not be big enough to allow any other activity. It must also have sufficiently tall sides (or enclosed on top) so that your dog will never try to jump out. The results of this could be implant breakage or loosening and a poorer result. You will need to keep your dog on leash at all times when out of the pen or crate. Think about the triggers that cause your dog to suddenly run or jump and try to avoid them. You also need to prevent any licking of the wound by the use of an anti-lick collar at all times. Why not get one before surgery so your dog can get used to wearing it? We generally perform TPLO surgery on a Thursday. It is best to book well in advance as we will need a day with no other surgery scheduled. You can expect that your dog will stay in overnight and be able to go home on the Friday afternoon. Read more about dog anaesthetics and managing dogs after surgery by following the links. A Constant Rate Infusion (CRI) is started before surgery and continued until the following day. Controlling pain before surgery (preemptive pain management) gives better results and requires lower doses. Your dog should wake up from surgery almost free from pain. Dogs are discharged on a combination of antiinflammatory and pain control medications for a period of two weeks. Xrays will need to be taken between 4 and 6 weeks after surgery to check that healing is adequate and that the surgery has been successful. After this time dogs should be able to start exercising on a leash. After a further 4 weeks of good improvement, a return to full exercise should be possible. The time-consuming nature of TPLO surgery and aftercare means that we may not be able to offer this procedure to all dogs. Depending on demand, we may restrict availability to existing patients; however, you are welcome to enquire. All Tibial Plateau Levelling Osteotomies, like all surgical procedures, have a risk of complications of around 5%. These can range from minor issues like excess pain or adverse drug reactions, to major complications like infection or implant loosening. Late complications of cruciate injuries include meniscal cartilage tears which would require a second, less invasive surgery to resolve. We do not claim that our complication rate will be equal to that of a specialist who performs the procedure every day. 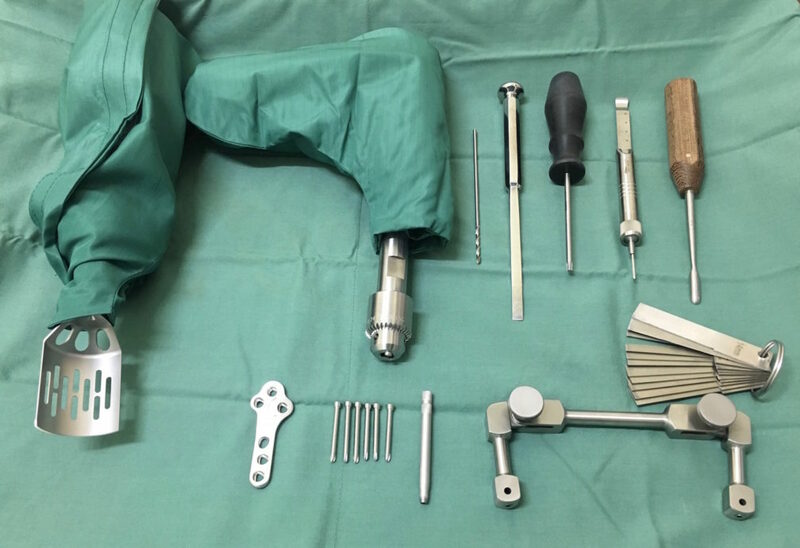 How Much Does TPLO Cruciate Surgery Cost? We apologise that we can’t give a price for TPLO surgery without assessing your dog in a standard visit. Once we do we will give you a detailed estimate of costs that will include all medications and follow-up xrays. We pride ourselves on giving accurate estimates; the only change to the final bill will be if there are extra findings (such as meniscal tears) beyond our control. Reference: Conkling, A. L., Fagin, B., & Daye, R. M. (2010). Comparison of tibial plateau angle changes after tibial plateau leveling osteotomy fixation with conventional or locking screw technology. Veterinary Surgery, 39(4), 475-481.